Andrew’s OT is working with him on strengthening his hand muscles, which in turn will help him with things like handwriting. She showed me where the muscles were located and what she was doing to help build these. That got me thinking about fun ways to work on this at home, so as I did my weekly shopping, I was on the lookout! 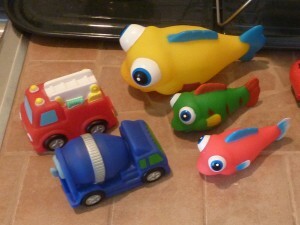 I found some squeeze toys at Walgreens and thought these would be fun additions to My Obstacle Courses (as well as bath and pool time). 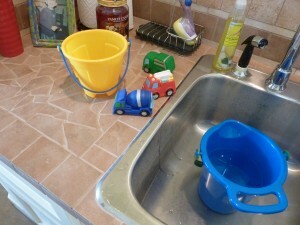 This is a great station to do at a sink. 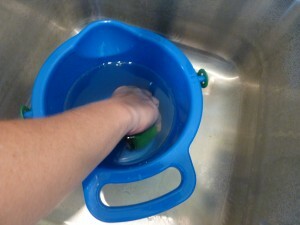 I use sand buckets or bowls that are deep enough as well as provide some sort of container to squirt the water into. 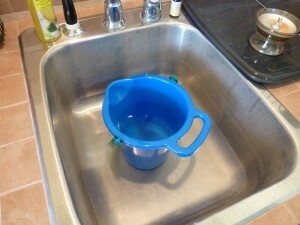 Sink with a bucket filled about halfway with water. The muscles I am using to squeeze this are the same muscles necessary for handwriting – try it! Pinch your thumb and first two fingers together to feel this. It always amazes me to break something down that comes easily to people and really think about all that is involved in some of the most basic tasks. We will be doing lots of squeezing stations this summer because while Andrew’s hand muscles are getting stronger they still need “workouts” like this. 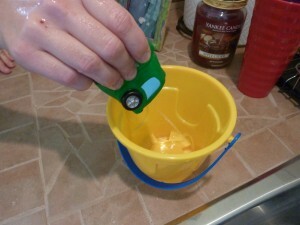 Squeeze the toy under the water, slowly releasing pressure to allow water to enter. 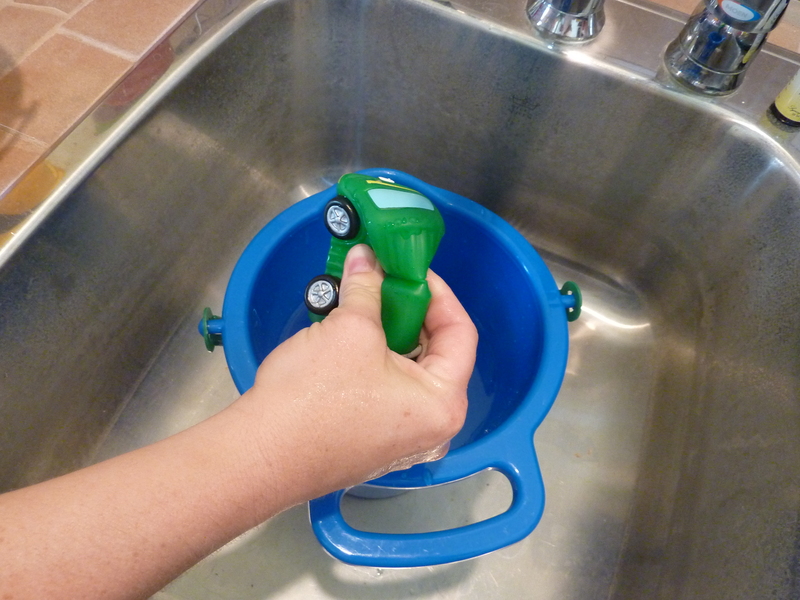 Squeezing the toy to spray the water out. To give this station activity more purpose, you could draw a line or tell them that they have to fill the container to a certain point, counting along the way to see how many times it takes to fill and squeeze before they reach that point. If you think this is something that is too “baby-ish” for your child, I can think back to watching a Survivor-like show (or maybe it was The Biggest Loser), with them doing something similar. The contestants had to run, get something that would absorb but also drip water, run back and squeeze as much water as they could into a bucket, doing this until they filled their bucket to the line. You could do something like this using the squeeze toys as part of an outdoors My Obstacle Course and they’ll never know they are building these hand muscles! !